Anushka Or Kareena: Who Looked Hotter In Chilli Red? You know the feeling when you wear a brand new dress to work and then you see a co-worker walking in wearing the exact same one? Yes, the knots in your stomach and the silent curses you throw at the situation - you're not happy. You're not happy at all. Moreover, now, you're comparing her look to yours, and wondering who looks better. And not for just a second, you're going to continue overanalysing every detail of your look (and hers) for the rest of the day. Now, if a regular fashion girl like you struggles with this unintentional twinning sitch, could you imagine what our Bollywood celebrities go through? Every other day, you end up wearing either the same colour, style or designer as someone else who's just as, if not more, famous as you. 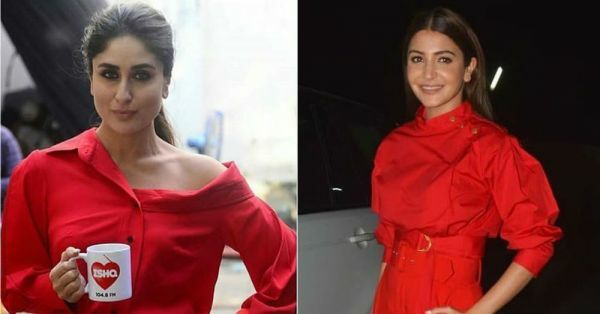 Kareena Kapoor must have had to face a similar struggle when just a day after she had worn her all-red outfit, Anushka Sharma stepped out in one too. Yup, for the Sui Dhaaga screening, the female lead, Anushka Sharma chose a red co-ord set too. It's a fashion face-off, obv. Let's see... Kareena Kapoor wore a chilli red button-down shirt, styled half-off her shoulder, and tucked into high-waist red pants. She paired colourful pumps with the all-red look but we're not too sure about them. They don't look great with the rest of the outfit because the print colours don't go with the hot red on Bebo's outfit. Usually, Kareena's kohl eyes are dead gorgeous but with this street-chic outfit, something more modern and clean would have been the perfect match. Moving on to Mamta aka Anushka Sharma, the Bollywood actress wore a chilli red belted top, with a side-snap detail, from Zara. This top, she styled with high-waist trousers, that came with a chunky retro belt, also from Zara. We've taken a fancy to the double-belt trend and Anushka Sharma has too, we think. This monotone look with perfectly in-sync belts is right up our alley. Ooooh, and did you see those pumps Anushka Sharma has on with the outfit? They're pastel coloured, so, they look great with the bold red outfit. Also, these Sophia Webster pumps are slogan statement pieces. Love. Unlike Kareena's misfit Kohl eyes, Anushka's makeup is just the right amount of dewy and 'natural'. By now, you know we've picked Anushka Sharma's red-hot look over that of Kareena Kapoor Khan's. You also know why - her outfit is more in-sync, and is a wearable combination yet red carpet-worthy, isn't it? 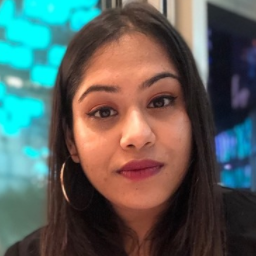 Plus, her makeup gives her a significant edge over Bebo's too. Anushka, we know you're a badass, and your look last night was just as badass. Better luck, next time, Bebo. She's still one of the most stylish Bollywood celebs and you know it. Want our fave Bebo look on a budget? Here you go.